Like cats? Love anime? Look no further. Chi's Sweet home is the adventures of an adorable kitten who gets separated from her mother and finds a new home with teh Yamada family. Sure, it starts out kind of cutesy (and yes, it does maintain some of that since Chi's a kitten), but cat owners/lovers will find that the anime is pleasantly loyal to feline behavior- even the bad parts- and explains it from a kitty-eye-view. As the series progresses, cat owners will find at least one cat that reminds them of one they've owned at one point- hyperactive, cute Chi; big, wise, relaxed tomcat Blackie; aloof, prissy Scottish Fold Alice; and many others. Another big plus to this series is that the episodes are three minutes long, so, if you just want a quick pick-me-up of cute, you can watch an episode or two, and, if you're starting to get addicted, as I am, you can marathon ten or fifteen episodes without wasting a lot of time or having to rinse out your eyes with water. However, I would not recommend this anime to everyone; if you hate cats, or you're not into the whole moe business, skip it. Otherwise, it's an entertaining watch- and guaranteed to put a smile on your face. This is definitely a must-watch anime. It only took me a couple of episodes to fall in love with this hyper, cuddly, and sometimes moody kitty. The other characters are wonderful as well. Youhei is like a sibling to Chi. They play together, eat together, and even sleep together. The parents also take good care of Chi and give her lots of love. I'm always excited to see what Chi is up to. I am so sad i ended and i want to watch more but i can't believe it ended and i hope they make more new episodes like Shugo Chara it continue i wish it continue also!XDDD :)))) :((( But i like the part when they have the party for chi it's the last episode and then all the cats comes adn i can't believe that at the end the black cat help chi get home and i felt bad for chi when she was all alone in the rain and nobody helped her ! This is honestly one of my absolute favorite series.. I love this little kitten, so sweet! It may be short and geared towards children but give it a shot, even people I know don't usually watch this type of thing have fallen in love with Chi and watched each and every episode. <3 Definitely worth the 3 minutes an episode! Chi is just too curious! 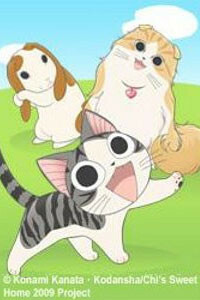 Chi's sweet home is a wonderful and sweet anime with short episodes showing scenes from Chi's daily life. Chi is a cat that lost her way finding her mother and was adopted by a new family even though their apartment didn't allow pets. Chi's so curious that each episode is like an adventure for her. It's a very heartfelt anime full of comedy and wrapped with cuteness! It shows how a kitten is like and how they act. You'll never get tired of this anime! I recommend you to watch it! Even though there are 208 episodes! Kitty's Review of Chi's New Address. A tale which depicts the life of a family who adopt a new mischievous kitten named Chi. She makes her way into the family’s heart in no time. Chi’s family loves her so much and go to great lengths to ensure her safety and happiness. The fun part is when you see the Cat to Human communication barrier. See Chi having new experiences and making new friends.